Suvarnabhumi Airport Hotel Co., Ltd.
Airport Rail Link Co., Ltd.
Thailand is one of those civilized nations in the world since the days of the Sukhothai and Ayutthaya, Thonburi. Since Sukhothai through Rattanakosin era, every monarch, who was the head of the country, has realized the importance of communication is essential to the prosperity of virtual blood to nourish lives. And in the passage of the blood line, the railway is one important pathway of blood. From the distant ages of the past up to the time when the city of Bangkok was chosen as the new capital of Siam, with the exception of the water-borne traffic along rivers and canals, the only means of inland communication in the country had been those borne by animals such as oxen, buffaloes, horses, elephants with howdahs and bullock-carts, which had indeed been very popular among the people of that time for their daily use in travelling as well as in transporting goods from place to place, until the transport by rail has started . A complete success was in the reign of "His Majesty King Rama V of Rattanakosin", which the construction of a railroad Siam from Bangkok to Nakhon Ratchasima has been announced, dated March 1, Rs 109, which corresponds to the year 1890. Before the Royal Train were born in the year 1855, it appears that the UK Government assigned Sir John Bowring, the Governor of Hong Kong, which has been appointed as Minister Plenipotentiary, and Mr. Harry Smith Parkes, Consulate Amoy, traveled by the British Navy to negotiate a revised Treaty of diplomatic relations the British government in India Made to the Government of Thailand on 20 June 1826. In that time, Mr. Harry Smith Parkes has brought new treaty to seal off the British mainland, and then brought back to exchange treaty with Thailand. Summoned to the royal message And tributed to Her Majesty Queen Victoria of the United Kingdom British came to sacrifice His Majesty King Rama the fourth. Tribute such as miniature replicas of real trains consisting of a locomotive and car trailers parades walking on the tracks by the force of steam just as the car used in the British Isles (now the railway is preserved at the National Museum). In that tribute Her Majesty Queen Victoria intended to impulse Majesty King Chulalongkorn the idea to establish a rail network in the Kingdom of Thailand. On the other hand the economy of Thailand was still in an unstable position and there are a few civil, therefore, the train project was paused. Tribute Train miniature replica of the real one. Later in the reign of King Rama V, politic events were stemmed from the expansion of the British colonies and France, which covered Indochina areas. His Majesty recognizes the importance of transport by rail. Because the use of the wagon and river was basically insufficient to maintain the royal territory. People who lived far from the capital, with inclinations towards neighboring countries. Therefore, it was reasonable to build a railroad in the country to keep in touch with the county border first. In order to ease the administrative, Surveillance invasion, and ope the terrain to the public for citizen to explore wilderness areas for the sake of the economic interests of the country, and to expand transportation (passengers and cargo) routes to reach each places more easily. So in the year 1887, he graciously let Sir Andrew Clark and Pan Chard McTaccard Lother Company to conduct a survey to build a railway from Bangkok - Chiang Mai, and the junctions, one from Saraburi - Nakhon Ratchasima, one from Mueang Uttaradit District - Riverside Thadeua, and another one from Chiang Mai to Chiang Rai (Saen Luang). The survey included eight parts, with the average wage does not exceed 100 pounds per mile. Both parties signed an agreement on 16 March 1887. After explored the different approaches, the government considered that the first point that deserves to build a railway linking the capital of Thailand is Nakhon Ratchasima. So in October 1890, he graciously established the Train Operation which was under the control of the Ministry of Public. Prince Krom Khun Narisra Nu Wat Wong and Mr. K. Bethge were the Directors of the State Railways. Simultaneously, the auction of a railway line construction in Bangkok - Nakhon Ratchasima as the first route at the Bangkok Railway office. It appears that Mr. G Moorea Campbell of England were the lowest bidder (9,956,164 baht). King Rama V, took the royal support to the Ministry of Public Works and approved the hiring of Mr. G Moorea Campbell to build a royal railway from Bangkok to Nakhon Ratchasima as the first line of a width of 1.435 meters. And have presided over the ceremonial action accompanying the opening of the railroad station area of ? ?Bangkok on 09 March 1891. The Train Operation has built a monument commemorating the inaugural of Royal Train, to commemorate this important events in the past, and to pay homage to His goodness. In 1896, the construction of the railway line from Bangkok - Nakhon Ratchasima was partly successful enough to launch. So on March 26, 1896, King Rama V had presided over the ceremonial opening of the railway station between Bangkok – Ayutthaya, distance of 71 kilometers. And opened for public transportsation between Bangkok – Ayutthaya since 28 March 1896 onwards. In the first stage, 4 trains trip/day to total of 9 stations, a station of Bang Sue, Laksi, Bangkok, Khlong 6 Rangsit, Chiang Rak, Chiang Rak Noi and Krung kao. The Train Operation has chosen "March 26" as the establishment of a rail, upto the present. Subsequently opened the next part of the route from Ayutthaya to Kang Khoi, Muak Lek, Pak Chong. Until the year 1900, the railway line of Nakhon Ratchasima were completed and His Majesty King Chulalongkorn has graciously consented to open this route, on 21 December 1900. The total distance from Bangkok - Nakhon Ratchasima was 265 km, all the money in the construction of the railway line was 17,585,000 baht. When the construction of the first railroad were completed, according to his wish, then he considered building a railway line until the other end of his reign, that gave birth to the train transportation in Thailand on October 23, 1910. After the reign of King Rama VI ascended the mighty thrones, crowned after his Father, he also considers that the affairs of the separated Northern Railway and the Southern Railway were not easy for supervision and management, also it was not cost effective. Therefore, on June 5, 1917, he graciously merged the two departments into one department called "The Royal Train". He graciously assigned his brother "Kromma Phra Kamphaengphet Akarayothin " to serve as the first commander of The Royal Train. In his era, He recognized that the use of a steam locomotive towing convoy was not easy, and expensive. Fireball that scattered out were also dangerous. Therefore he ordered 2 diesel locomotive towing convoy from Switzerland to use for the first time. The first diesel locomotive, the machine number 21-22 were running to serve the people in 1928 (at the present, this convoy was installed at the Railway Headquarters Building so that future generations can continue to learn the history). Because he gave birth to a diesel locomotive in Thailand, therefore, all diesel locomotive towing convoy in The Train Operation are now decked with a "Purachatra Sign" as his name attached to the side of every locomotive that has been ordered to Thailand, to commemorate and honor Him forever. The first diesel-electric locomotive number 21. The Train Operation, which began in the reign of King Chulalongkorn, Rama the fifth since 1896, until the end of his reign in 1910, the total of 932 kilometers were opened for public transport, and 690 kilometers were under the construction. In the reign of King Rama VI, had total length of 2,581 kilometers and 497 kilometers were under the construction. In the reign of King Rama 7, he implemented policies to maintain communications as well as the days before, but due to the economic conditions of the country were fluctuated, so the construction of the railway were delayed, with 418 kilometers of railroad increased. The Train Operation in the reign of King Rama 8 is the same as before, which Thailand had to encounter with financial conditions, and World War 2, the construction of the railway was not progressive as it should, with 259 kilometers of additional railroad construction. For The Train Operation in the reign of King Bhumibol Adulyadej Rama 9th, during the World War 2, building assets, and locomotive wheel were damaged, so they must be rebuilt quickly to return to its original condition. Relying on a single source of investment from the state budget were not enough, so the government had to borrow money from the World Bank fund. During the loan negotiations, The World Bank has proposed a reorganization of the Department of Royal Train State to be more independent, which provided the flexibility in the management of the railway, commercially. In 1951, the government lead by Chom Phon Por Pibulsonggram, as Prime Minister, has agreed to manage The Train Operation separately, so they have proposed a draft law to Parliament Railway of Thailand, and have enacted a statutory enactment, to be announced in the Government Gazette, dated 30 June 1951, the Royal Train as it changed to the type of public enterprises under the name of "The Train Operation of Thailand" from 01 July 1951 onwards, operating under the Act., of the railway company 1951. Term as the State Railway of Thailand. 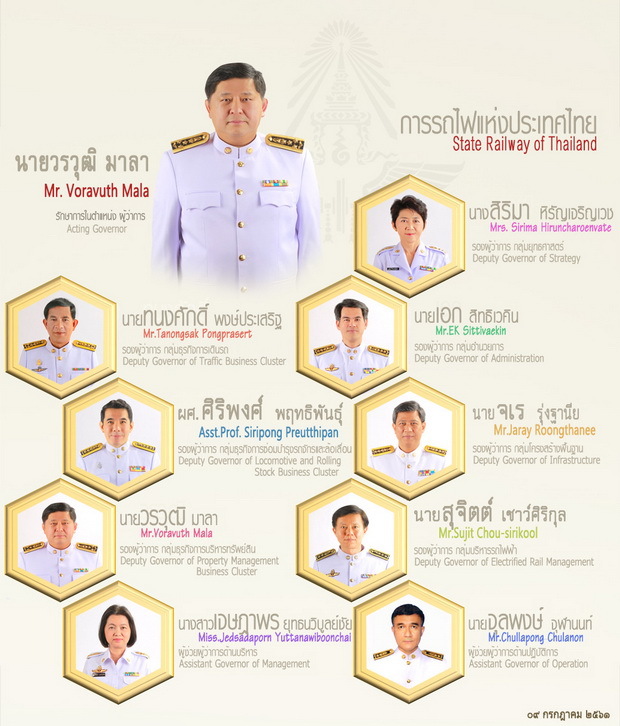 The Cabinet Committee is responsible for the State Railway of Thailand.Governance of the organization consists of one Chairman and 6 the Board of people. The railway company Position as a director. And the state has donated 30 million baht to fund the initial capital of the State Railway of Thailand. This is Gen. Jaroon Ratanakul SaereeRuengrit as the State Railway of Thailand from 01 July 2494, which, in principle, state control and fire management. Control rate of salary Control of fares and freight. Oversaw the opening - the routes and services. And control of all investment If loss State compensation for the shortfall. Currently railway company the distance the launch totaling 4,346 miles by a double range - Dormitory distance of 31 kilometers and a three part Rangsit - Ban Pachi junction about 59 kilometers, the route as follows. -. - The line north to Chiang Mai Distance 751 kilometers. - The line south to Narathiwat (Su Ngai Ko Lok) Distance 1143 km and Padang Besar Station Distance 974 kilometers. - Line east to Sa Kaeo (Aranyaprathet) Distance 255 kilometers and Ta Phut Industrial Estate, a distance of 200 kilometers. - The North East Line to Ubon Ratchathani and Nong Khai Distance 575 kilometers distance of 624 kilometers. - the line west to Waterfall Station at Kanchanaburi Distance 194 kilometers. - the line Mae Klong Wong Wien Yai part-Mahachai Distance 31 kilometers and Baan Laem - Mae Klong distance of 34 kilometers. It also includes the construction of several routes, including canals 19- Baan Phachi – Kang Khoi - Sri Racha - Laem Chabang – Kao Chee Chan - Map Ta Phut. For the projects to develop the east coast as well. Strive for excellence in providing a convenient rail punctuality and safety. 1. The railway company focused on providing services that meet the needs of service users. To generate revenues and profitability of the organization, including the development of effective services continuously. As an alternative to transport efficiency. 2. Railway transport services in social action. For the common good of the people and the country. And serve the transportation service, low prices and efficient government. 1.To create excellence in the service of the railway company. Environment changes. 2.To improve the performance of the railway. Both business and non-business as well as managed costs effectively. 3.To achieve organizational and personnel development plan in line with the rail infrastructure. This will lead to a sustainable competitive advantage for the company in the long run. Can be divided into two groups, including the strategic plan. 1. Group strategy development management system of the company. (To strive for excellence in providing rail system) consists of five strategic question. 2.) Strategic, financial, and accounting. 3.) Strategy development and organizational management. 4.) Strategy development and management personnel. 5.) Strategic Information and Communication Technology. 1.) Strategic services and freight transportation. 2.) Strategy and locomotive wheels.